Chinese portal of VR-Zone has got some interesting details about Intel’s upcoming Haswell processors. 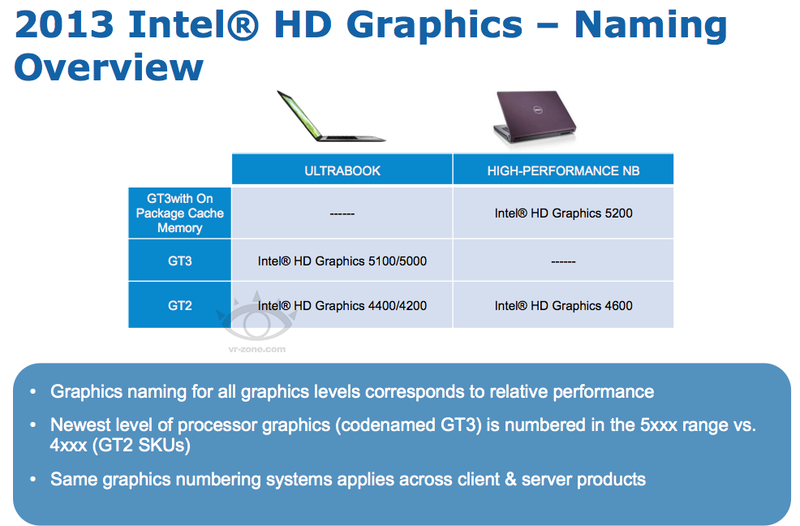 According to the details, Intel Haswell mobile CPUs with the GT3 graphics chip will arrive in Q3 2013 with six mobile CPUs. Intel Haswell desktop processor lineup is expected to launch on 2nd June 2013. The complete lineup along with their 8-Series chipset motherboards can be found here and here. The mobile Intel Haswell lineup would arrive a little later in Q3 2013 (October) however with a much faster graphics processor compared to what the Desktop GT2 chip would be. Intel Haswell Mobile processors or a total of 6 of the latest Core 4*** series mobile CPUs would ship with the GT3 graphics chip codenamed HD 5200, HD 5100 and HD 5000. Six more models of Intel Haswell mobile processors would ship with the GT2 graphics chip codenamed HD 4600, HD 4400 and HD 4200. So there would in total be 12 mobile CPUs from Intel in Q3 2013. 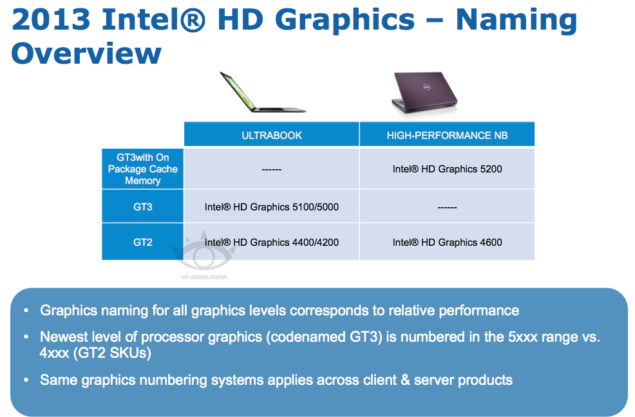 As far as naming scheme goes, the top GT3 HD 5200 graphics chip would be shipped with high performance notebooks and would feature on-package memory cache.Only two models which include the Core i7-4950 HQ and Core i7-4850 HQ would ship with the GT3 HD 5200 graphics chip.